, bishop of Exeter in the reign of queen Elizabeth, was born at Great Wycomb in Buckinghamshire, and educated at Eton school. In 1528 he went from thence to King’s college, Cambridge, where he took a bachelor’s degree, but removed to Oxford, and spent some time in the academical studies of that unitersity. He afterwards married, was presented to a living, and became a zealous reformer. On queen Mary’s accession he left his cure, and retired into the north of Epgland, where he maintained himself by keeping a school and practising physic. On queen Elizabeth’s accession, when he could avow his principles with safety, he went to London, and was appointed to read the divinity lecture at St. Paul’s, in which he acquired great reputation; and in July 1560, was consecrated bishop of Exeter. He was not created doctor of divinity until November 1561. 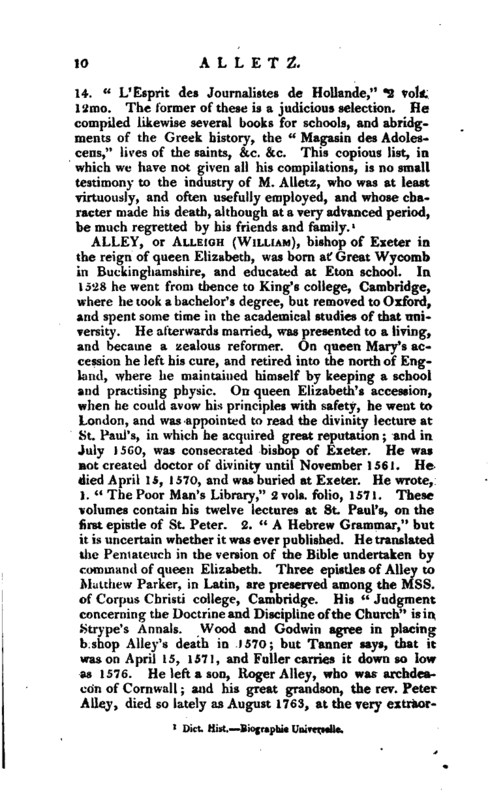 He died April 15, 1570, and was buried at Exeter. He wrote, I. “The Poor Man’s Library,” 2 vols. folio, 1571. These volumes contain his twelve lectures at St. Paul’s, on the first epistle of St. Peter. 2. “A Hebrew Grammar,” but it is uncertain whether it was ever published. He translated the Pentateuch in the version of the Bible undertaken by command of queen Elizabeth. Three epistles of Alley to Matthew Parker, in Latin, are preserved among the Mss. of Corpus Christi college, Cambridge. His “Judgment concerning the Doctrine and Discipline of the Church” is in Strype’s Annals. Wood and Godwin agree in placing b shop Alley’s death in 1570; but Tanner says, that it was on April 15, 1571, and Fuller carries it down so low as 1576. He left a son, Roger Alley, who was archdeacon of Cornwall; and his great grandson, the rev. 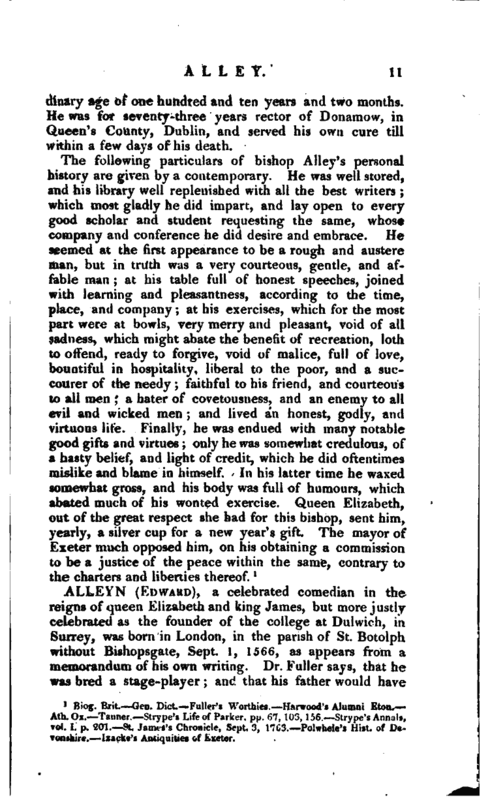 Peter Alley, died so lately as August 1763, at the very | extraordinary age of one hundred and ten years and two months. He was for seventy-three years rector of Donamow, in Queen’s County, Dublin, and served his own cure till within a few days of his death. Biog. Brit. Gen. Dict. Fuller’s Worthies. Harwood’s Alumni Eton. —Ath. Ox. Tanner. —Strype’s Life of Parker, pp. 67, 103,, 156. —Strype’s Annals, vol. I. p. 201. St. Janu-s’s Chronicle, Sept, 3, 176if. Polwhele’s Hist, of Devonshire. Izacke’e Antiquities of Jixeler.